Living West of Boston -- Concord, Wayland, Sudbury, Maynard, Stow...: Wayland Real Estate Update - Home Sales and Prices Up in May! 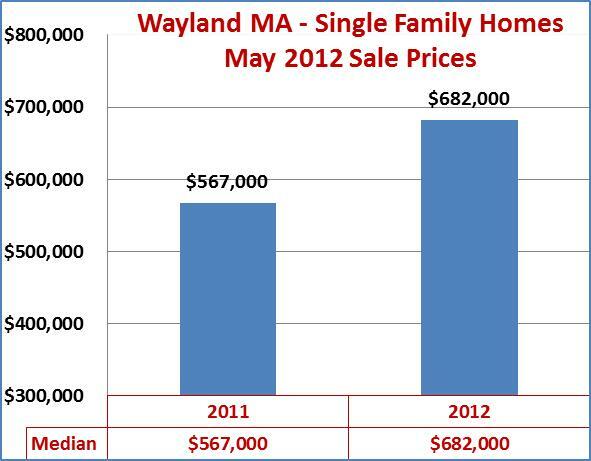 Wayland Real Estate Update - Home Sales and Prices Up in May! The Wayland (MA) market continues to be positive! Currently there are 91 single family homes for sale in Wayland; last year at this time there were 110. Seventeen of the 91 active listings already have accepted offers and are being shown only for backup offers until contingencies have been fulfilled. List prices range from $214,900 to $14,900,000. The good news for buyers, and for sellers who plan to either move up or down-size in Wayland, is that median and average list prices are lower than last year at this time. The median is $659,900; the average is $1,095.292. Homes that are priced correctly are selling quickly, however, there were also 29 price reductions on 26 properties during May. It is important for people who are planning to sell to keep this in mind when deciding on a list price for their home. While it's true that you can lower the price later, new listings get the most attention within the first 3 weeks, after that, you're playing catch up. Sales Pending: There were 27 single family properties that went pending in May, up from 20 in April 2011 and also up from 21 this past April. These pending sales will close in the next month or two and sale prices will be known upon closing. Closed Sales May: There were 14 closed single family home sales in May, exactly the same number as in May 2011, and also April 2012. The median sale price was up - $682,000 compared with $567,000 in May 2011. Year-to-date Sales (1/1/2012 - 5/31/2012): Year to date sales and prices continue to increase over last year. There have been 64 closed sales in 2012, up from 40 for the same period in 2011. And sale prices are also up. The median sale price to through 5/31 is $545,500; it was $483,000 for the same period in 2011. Condominiums/Townhouses: Closed sales of condos in Wayland were also up in May and year-to-date over last year for the same period. There were 6 in May, up from 3 in May 2011, however, median sale prices were lower - $467,500 compared with $589,900 in May 2011. If you want to live in Wayland, be prepared to step up when you find a house that fits your needs. Get pre-approved for a mortgage before you visit any houses so you know exactly what you can afford. Decide what the trade-offs are (location, size, and condition) and connect with an experienced buyer broker/agent who can navigate you through this busy market!